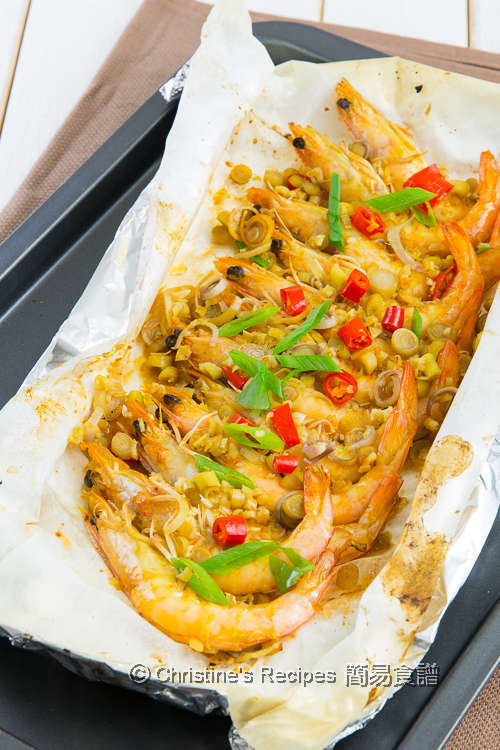 This baked prawn dish is absolutely delicious as all the prawns (shrimps) are submerged in a rich-flavours and fragrant lemongrass marinade, enclosed and baked in a paper parcel. You can imagine how fragrant the prawns will be after the lemongrass aroma imparted into them. Best of all, making this delicious dish is fuss-free. All you need is to marinate the prawns 15 minutes before popping them in a preheated oven. The prawns with their juice inside the parcel are ready for you to enjoy in just 20 minutes. Hope you’ll give it a try and love it as much as we do. Rinse prawns. Wipe dry with kitchen papers. Use a pair of scissors to cut open the shells at their backs. Use a sharp knife to slice the meat lengthwise. Yet make sure the meat still keeps intact. Devein. Set aside. In a large mixing bowl, put in lemongrass, garlic, red chilli and all the marinade ingredients. Mix well. Add prawns and marinate for about 10 minutes. Prepare a baking tray. 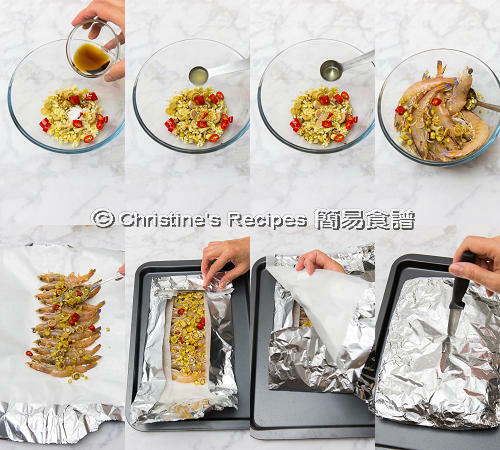 Put a large foil and baking paper on the tray. Arrange the prawns in one layer. Pour in all the marinade on top. 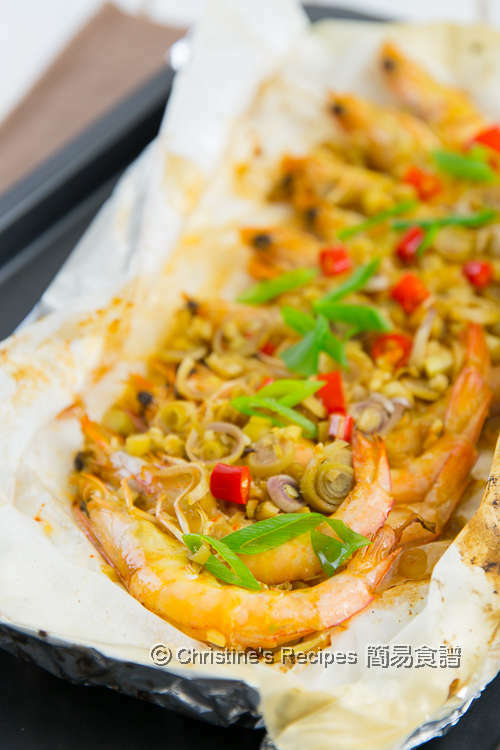 Wrap the prawns with the foil and baking paper into a parcel. Use a sharp knife and poke two to three holes on the parcel. Bake in the preheated oven for about 20 minutes, or until the prawns turn opaque and slightly pink in colour. It’s cooked. Serve hot. 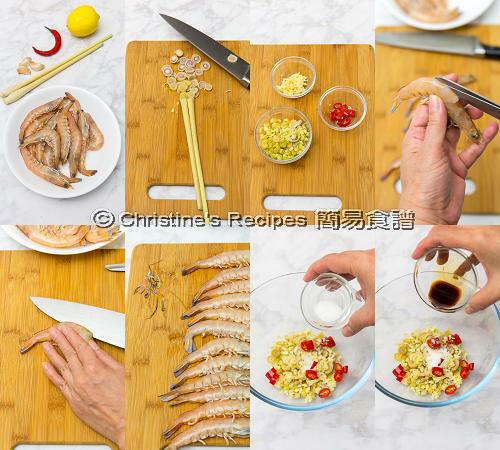 By cutting open the shells and slicing the meat, it helps the prawn meat absorbs the flavours of marinade. It’s also more convenient to consume. You might like to remove all the shells, and mix the meat with marinade, then bake in parcel instead. I just feel this baked prawn dish will become more flavoursome with the shells on. The baking time depends on the size of the prawns you use. I could almost taste these delicious and fragrant prawns. Yum! I love that lemongrass marinade! These baked prawns look so delicious and must be packed with flavours. Thanks for sharing, Christine.